1. 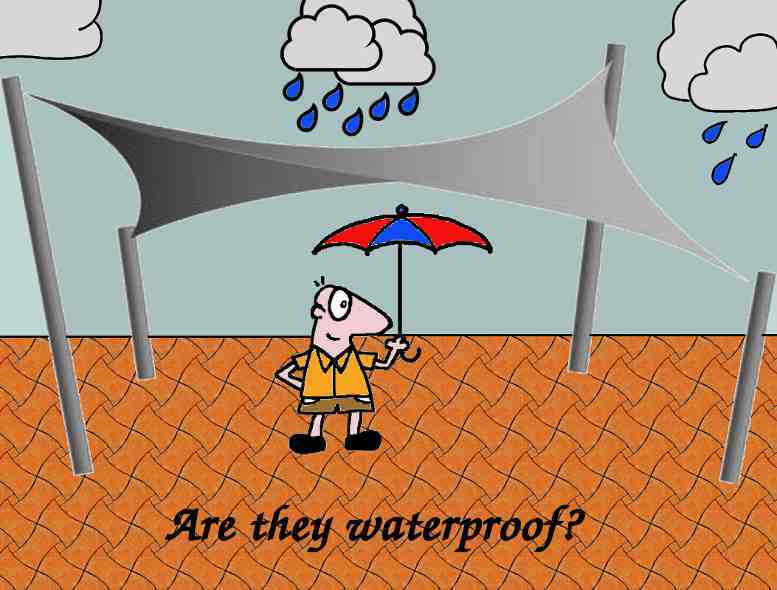 Are shade sails waterproof? 2. 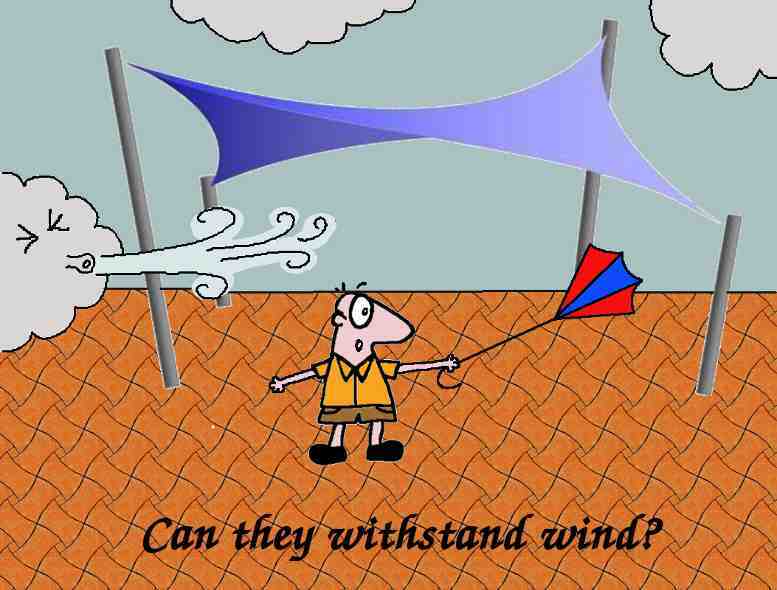 What about the wind? 3. How much sun protection? 4. 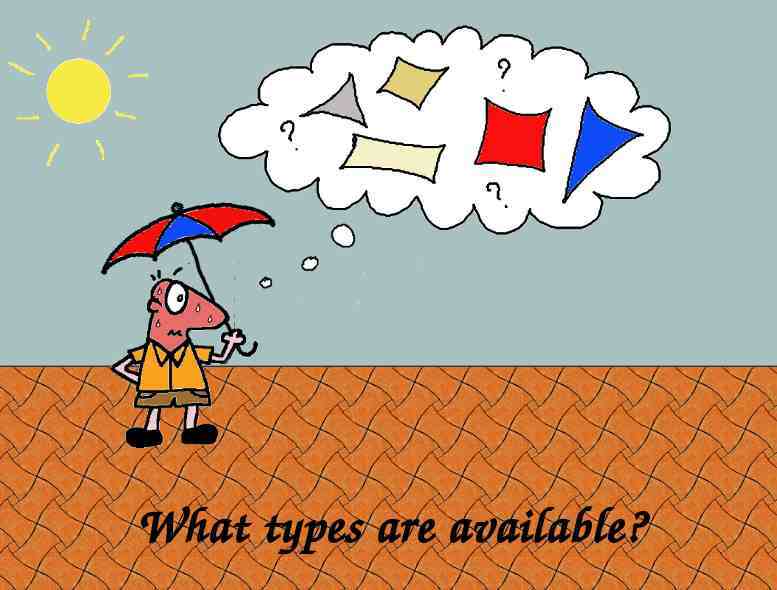 What types are available? 5. What is the best layout? The majority of shade sails are shower proof but not fully waterproof. To provide a cool shade the shade sail fabric is a permeable material that allows the sail to breathe. This allows heat to escape through the material. A fully waterproof material like a tarpaulin will trap the heat and not provide a good shade solution. Despite being permeable, shade sails do provide some protection from rain. For example, they would provide protection from a light summer shower. In heavier rain the water will run across the surface of the sail but will also drip from the underside. 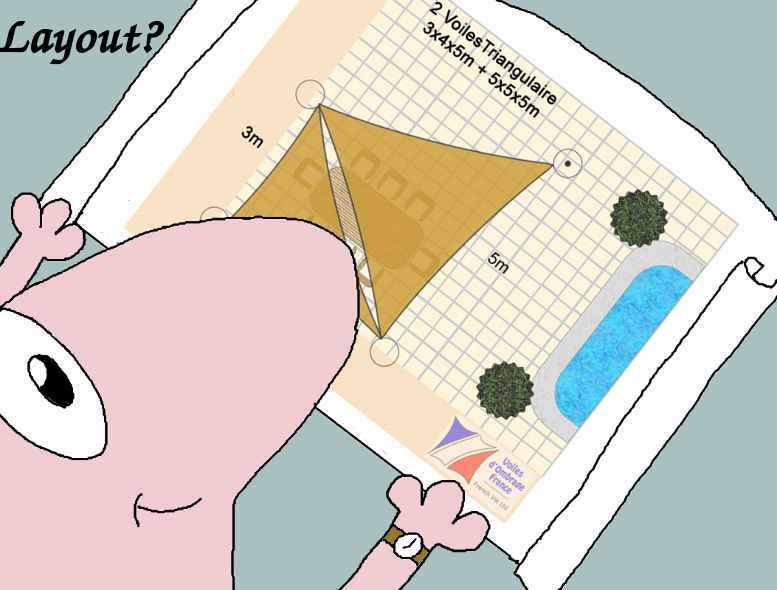 For this reason we advise that shade sails should be installed with a slope (15 degrees) to encourage water run off. 2. Can shade sails be used in windy locations? A good quality shade sail that is correctly installed will be able to withstand high winds. Shade sails are designed to form a tensioned structure; under tension the sail adopts a relatively solid shape and should not flap in the wind. It is important to note that any wind force will be transmitted by the sail to the mountings, so the fittings and attachment points need to be very secure. The amount of tension required varies depending on the size of sail but is typically 30-50Kg at each corner for a small to medium size sail. Larger sails will require much higher tension. The fittings used at each corner should include a screw tensioner to allow the necessary force to be easily and safely applied. The edges of shade sails are curved, which has the effect of reducing the shaded area but is essential to achieving correct structural tension. As the tension is applied at each corner, the edge curvature reduces which in turn applies tension to the surface of the sail. The quality of the shade sail also has an influence on its durability. High quality fittings and a reinforced border are essential if the sail is to withstand the high tension forces, which will be multiplied when exposed to the wind. 3. 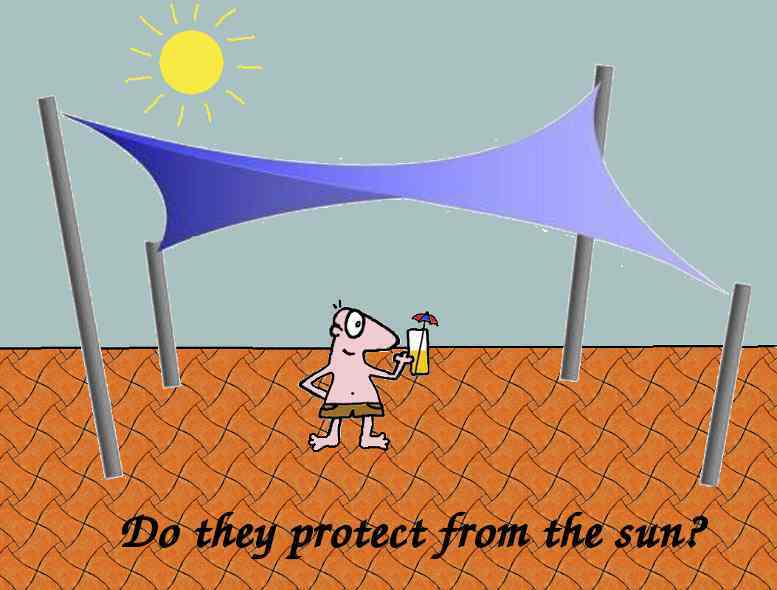 How much sun protection do shade sails provide? Shade sails were invented in Australia specifically to provide cool shade from the intense heat of the sun. They typically absorb over 90% of harmful UV radiation, providing all day protection from the heat of the sun. In addition, the specialist shade sail fabric is breathable which allows hot air to escape through the material - this provides cool shade unlike canvas or other impermeable products which trap the heat. There are some variations in UV absorption depending on the weight of the material and the colour, but these differences are quite small, typically less than 5%. 4. What sizes, shapes and colours are available? Shade sails are available in a wide range of shapes, materials and colours. The most popular form of shade sail is the triangle, which is aesthetically pleasing to the eye and is the shape that most closely resembles a ship's sail. Four sided shapes (square or rectangle) are also very common. 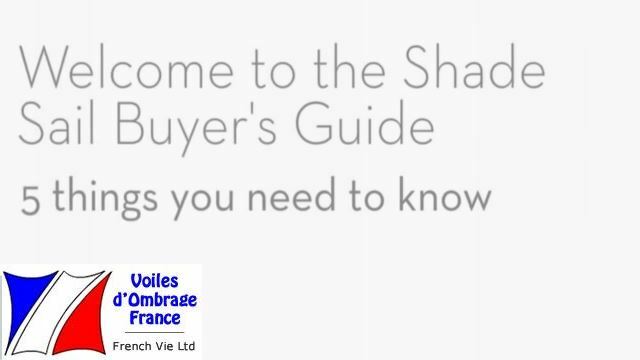 Shade sails are generally available in a limited range of standard sizes and colours and these "off the shelf" products do provide a cost effective solution. Custom made sails are available in a wider range of shapes and colours, including 5,6 and 7 sided designs. These can be made exactly to the dimensions required, but are more expensive than the standard product. Delivery time is also longer for a made to measure solution, whereas standard products are normally held in stock for fast delivery. Sail Shape - A four sided sail will generally provide more shade than a three sided sail. However, three sided sails have a more attractive appearance. To cover a larger area, multiple three sided sails can be used side by side or superimposed. Note that sails mounted side by side will leave a gap in between due to the curved edges. Sail Area - Small sails (<15m2) will be less affected by the wind. In a windy location it would be preferable to use several small sails rather than one large one. Larger sails require higher tension during installation and correspondingly stronger mounting points. Sail Material - Standard quality material (220g/m2) is generally suitable for residential applications, typically up to 6m side length with a maximum area of 30m2. For larger sails and commercial applications where the sail will be subject to higher wind loads, a heavier grade material will be required (340g/m2).